The roomy retail box of the Sony Xperia M2 covers just the basics in the shape of an A/C adapter, a microUSB cable and a headset. 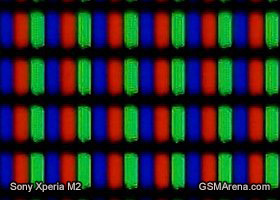 With a bigger screen to show for it, the Sony Xperia M2 is obviously taller than the original Xperia M. It stands at 139.7 x 71.1 x 8.6mm and weighs a solid 148g. This is very close in fact to the dual-SIM five-incher, the Xperia C.
It's not just the size actually, the two handsets have quite a lot in common. Sony has keept the OmniBalance design for a second generation in a row now and it still does the job quite well. What the Xperia M2 lacks compared to the Xperia C is a removable battery cover, and therefore a user-accessible battery. What looks like glass on both sides, is actually a pretty close resemblance but the Sony was obviously mindful of the budget. A closer inspection reveals the rear is actually made of extra glossy black polycarbonate. It's so reflective it can almost replace a mirror. The downside of this finish is it would get covered in smudges if you even so much as look at it. 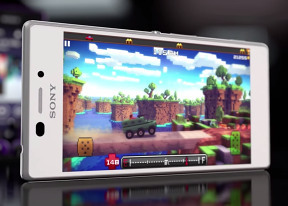 The Sony Xperia M2 comes with a 4.8" display, which HTC might try to sell to you as a mini next year. It isn't the most compact smartphone around, but not impossible to operate single-handedly. The Xperia M2's matte sides provide at least some sort of proper grip, which is more than welcome considering the super slippery rear finish. The Sony Xperia M2 has a 4.8" LCD display of qHD resolution (540 x 960px) for a decent, even if hardly spectacular, 229ppi sharpness. It is protected by a layer of Gorilla Glass 3, though the absence of oleophobic coating makes fingerprints a problem. The surface is not as easy to clean as we would like. Color rendering looks okay, but the white balance is on the cold side meaning there is a subtle bluish tint. On this smartphone the side viewing angles are OK, with little loss of contrast and color shift when you are not looking at the screen head on. The overall image quality is quite decent, the display is very bright and the contrast is great. The front display glass is quite reflective too, making the screen hard to read in direct sunlight.